With La Cenerentola rehearsals well underway, it's time to start introducing the terrific singers of our ensemble cast for this lively Rossini comedy. 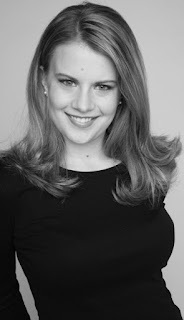 Today we hear from Sarah Larsen, the wonderful mezzo soprano, now in her second year with Seattle Opera's Young Artists Program, who plays Cinderella's vain half-sister Tisbe. Sarah made a strong mainstage debut last fall and was a memorable Suzuki in Madama Butterfly for us. 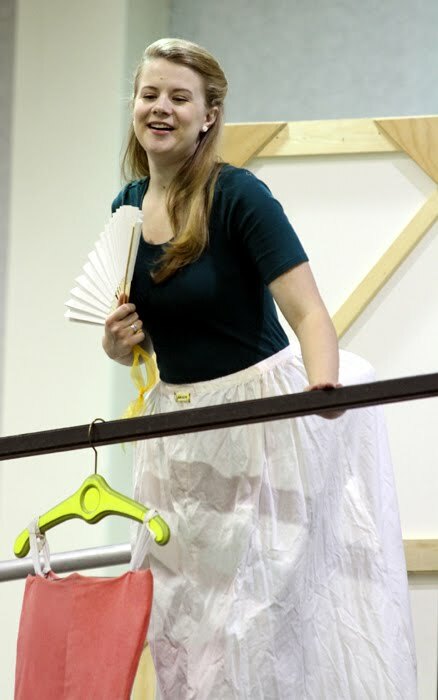 She's having plenty of fun now exercising her comedic skills in a completely different kind of opera--and remembering the important role fairy-tales, and theater pieces and films made from them, played in her life as a young person. Welcome back, Sarah! We loved having you on the mainstage last spring...but tell us what you did last summer. I was an Apprentice Artist at Santa Fe Opera, and had one of my most rewarding opera experiences so far covering a role in King Roger, in Polish. Stephen Wadsworth was the director, and Evan Rogister was the conductor. I loved doing that. It was scary at first, but it fits in there, somewhere in between singing in German and singing in Russian! Yes, he was the only Polish singer there, singing the title role, and he was amazing. Yes! Pat Racette, my Butterfly, did a soprano masterclass for all of us. To see her work on “Un bel dì” with someone was intense. I was sitting in the back of the room, saying to myself, “Ok, Sarah, you can’t cry, keep it together...” Because I had been with her in that situation, and to see her working with someone on that was so touching. She’s fantastic. I know you were dashing around the state earlier this fall doing Verdi’s comic opera Un giorno di regno. How much experience do you have performing in comedies? 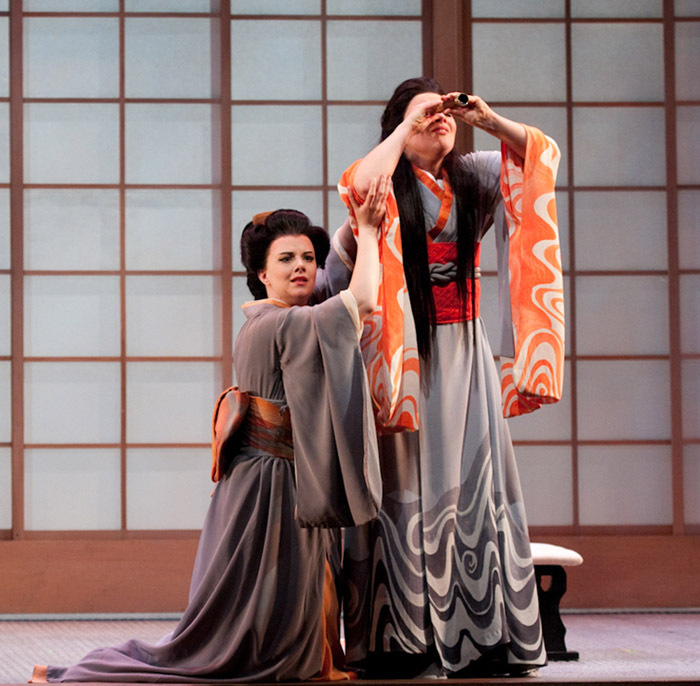 We’ve seen you doing lots of serious roles so far in Seattle: Charlotte in Werther, Suzuki in Madama Butterfly. Most of my experience has been in tragedies. It’s so fun, now, to be able to let loose in this terrific comedy. But comedy is much more difficult. You really have to hit your marks every time. You can’t fudge anything. It has to be precise. Especially with this production of Cenerentola. We’re working really hard on keeping everything precise and clean. That’s what makes the audience react—you’re doing it wrong when it’s you onstage reacting, instead of the audience. How do you know when you’ve got something that works? The director generally knows best. A singer might think that something they’ve come up with is really really funny, but it might not read at all. Right, then you want to make the most of your bit, and that can be dangerous. Is the inverse of your precision-axiom true? If it’s so crucial to be precise in comedy, then is it ok in tragedy to be imprecise? Or do you have more leeway, in a tragic context, to do it slightly differently at each performance? I think so...you may have a little bit more freedom, depending on the piece. But it’s not as if one is easier than the other. They require different kinds of concentration. 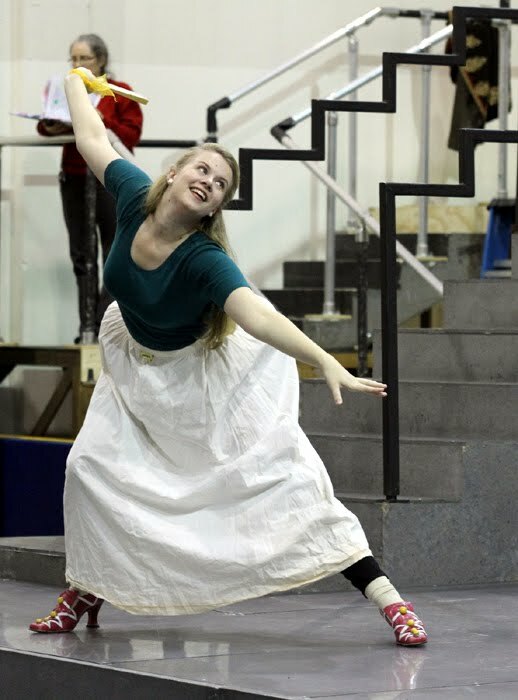 What can you tell us specifically about your character in La Cenerentola, wicked half-sister Tisbe? What color should we look for, when we’re trying to tell you apart from your big sister Clorinda? I have yellow hair, with pink curlers at the top, and a pink dress. 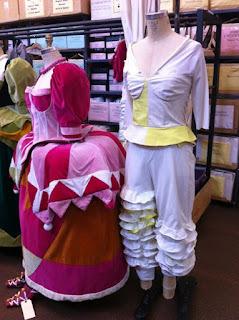 I just came from my costume fitting—it’s a lot of pink! It’s a really, really, fun costume! I’ve been following this production ever since it premiered in Houston, a good friend was the original Clorinda, and I remember seeing pictures she took of the shoes, the costumes, the hair, and I thought “I want to do this production, that looks like so much fun!” And I’m just crazy-excited about doing it now. We’re having a little bit too much fun in there [points toward the rehearsal studio]. Do either you or Clorinda have any real, genuine attraction, either to the prince or his valet? I think it’s just status. Look at the house where we live, and our costumes, yes, they’re very bright, but they’re all patched together. We have definitely fallen on hard times. We’re looking for the number-one way to get out of there, and the possibility of getting married to the prince—that’s our ticket to heaven, right there. Yes, we love him. We like to make fun of him...he’s an endearing curmudgeon. But he’s the reason we actually have dresses, to go to the ball. 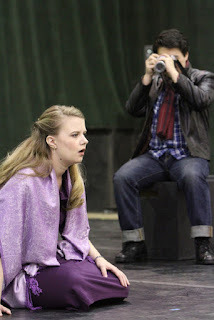 Now, besides Cinderella, you’re the other mezzo in our production. Are you learning the title role in hopes of one day singing it? I am, I’ve been looking at it for a couple of years now. It’s ridiculously challenging, and I’ve been learning a lot about myself as I’ve studied it. My voice has been growing, my technique has been getting more secure, and certain things are getting easier. It’s great seeing Daniela [Pini] and Karin [Mushegain, the two Cenerentolas] sing this, because it seems so easy. I have so much respect for that, because I have been working so hard! I think in a couple more years, I might be ready. It’s one of those roles you aspire to, as a mezzo. It’s so virtuosic. Ok...but I’d think that, in terms of the acting, Tisbe probably has more fun. Cenerentola is such a goody two-shoes. Maybe, but I think my temperment is more a Cenerentola temperment. With the two wicked sisters, we’re just running around and playing, the whole opera long. Did fairy-tales play a big role in your life when you were a kid? I loved fairy-tales. I actually sang Cinderella in the Rodgers & Hammerstein musical when I was 14, and it was great. I’m an only child, so reading was very big in my life; I had both volumes of the Grimm fairy-tales. They’re really violent! Yes, the wicked stepsisters don’t come out very well in there! But I think it’s important, for kids, to read fairy-tales. And better go for the original, the oldest documented versions of these things we have. Were you obsessed with Disney princesses when you were a little girl? I was a princess for Halloween, a few times. My mom is an opera singer, and I would dress up in her gowns and flounce around the house and pretend that—I think it was that Captain Hook had captured me, and taken me to a palace, and there was a prince who was going to come save me. We only children have active imaginations! Captain Hook, that’s interesting...Peter Pan is one of the more boy-focused Disney stories. There may still be a recording—and if you try to find it, I will kill you—of me as a kid doing all the roles in Peter Pan, you know, saying one line as Wendy, and then going and putting a hat on and now I’m Captain Hook. It goes on for hours. Were you just...improvising a script? No, I knew the whole thing by heart, from the movie with Mary Martin. But old-school Disney; did you get swept up in Snow White and Sleeping Beauty, or were you raised more with the new liberated girls, in the ‘90s? I really loved Sleeping Beauty, Beauty and the Beast, and Cinderella. The first movie I ever saw in a theater was The Little Mermaid. I loved all of them, like every little girl. I remember seeing a production of Cinderella, the Rodgers & Hammerstein musical, when I was about 12, and after the performance the lead still had her ballgown on, she was surrounded by little kids, encircling her, wanting a hug. And when I did that role, a couple years later, to see all the little girls who had dressed up for the show was the greatest thrill. I’ll never forget it. Do you think little girls will like this production of La Cenerentola? Oh, I think so. It’s so much fun! We’re just running around playing. It’s easy to get lost in it. When you and I were talking before Madama Butterfly, you mentioned how much you love singing close harmonies. You get to do a lot of that in La Cenerentola. This is my dream come true. I love ensemble operas like this, and Così, or the Flower Duet in Butterfly. There’s something, physically, about making music with someone in that close, tight harmony, which makes me so happy. That’s all I do, and I am so happy about that! Have you ever done so much patter singing? No. I had to work really hard, and I’m thankful for the education I got, specifically in my Master’s program, about how to approach text, because there are so many words flying by so quickly when you’re singing patter. Richard Bado, who was my instructor at Rice University, would make us break it down starting from the end of the phrase. For example, when we’re singing “Don Ramiro ha da cascar,” I’ll start working on just the ‘-car,” then “cascar,” then “da cascar,” then “ha da cascar,” like that. Yes, because it’s so easy, if you get off even by one syllable, it just all goes away. That must be fun, too...there must be a thrill to singing patter, like doing crazy coloratura. Yes, Don Magnifico has a ridiculous amount of patter, in his arias, and I’m finding I have to concentrate to stay in the scene, because I’m so, “How on earth is he doing that!? !” I want to stand up and clap for him...but I can’t. Finally, Viva Verdi! We’re looking forward to this great Verdi concert with our Young Artists next spring...what will you be singing? I’ll be singing Flora, we’ll be doing the first act of La traviata. And a couple of arias, one from Nabucco, Fenena’s aria “Oh dischuiso è il firmamento,” and the Preziosilla aria from La forza del destino, “Rat-a-plan.” I’m really excited about that—it’s lots of fun, and she interacts with the chorus. Yes. Actually, the first musical I ever did, in 8th grade, was called The Play’s the Thing, and I played a character called “Forza,” who was a gypsy. That’s all I really remember about it. But my musical career is coming full circle! [laughs] That concert is going to be terrific—the whole last act of Rigoletto is going to be there, plus a trio from Don Carlo. I’m looking for a nice dress!